It could be for a birthday, or for Christmas, or a housewarming. At any time of year, there may be an occasion where you need a good gift idea for a writer in your life. It might be a little easier for writers to shop for other writers, but in case any non-writers are out there thinking of gift ideas for their writerly loved-ones, here are some suggestions. This might seem lame at first, but think outside the box. What does the writer in your life like? Colours? Paterns? Animals? Notebooks come in all shapes and sizes if you know where to look. Here are some of the gems in my collection. 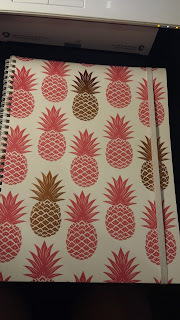 I prefer to take A4 notebooks to uni or if I'm writing a story by hand, but I also like a notebook that pops. Typo always has great notebooks with funky colours and patterns and quotes. 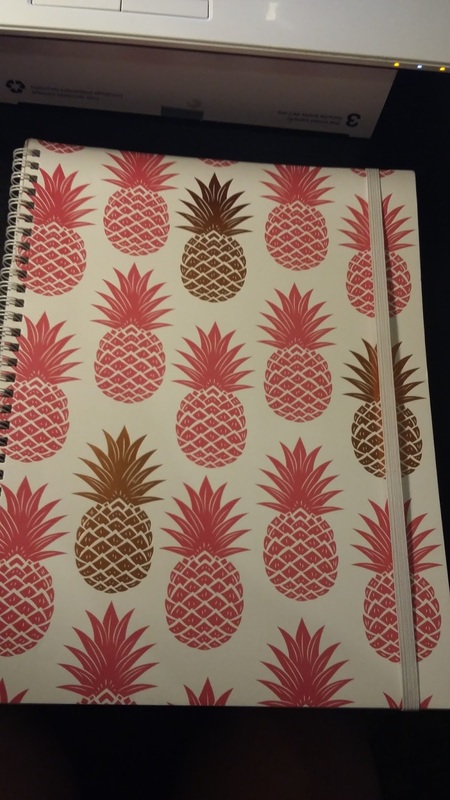 Here's one with shiny pineapples. This little guy was a gift from a few years back. 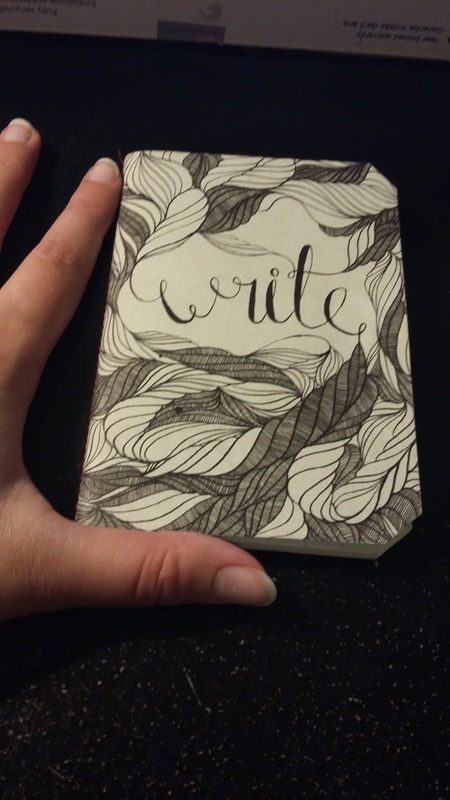 My partner found it on Etsy and it's perfect for jotting down little one-liners and ideas. Look out little it is next to my hand! I got this one for myself earlier in the year when I saw it at Officeworks. 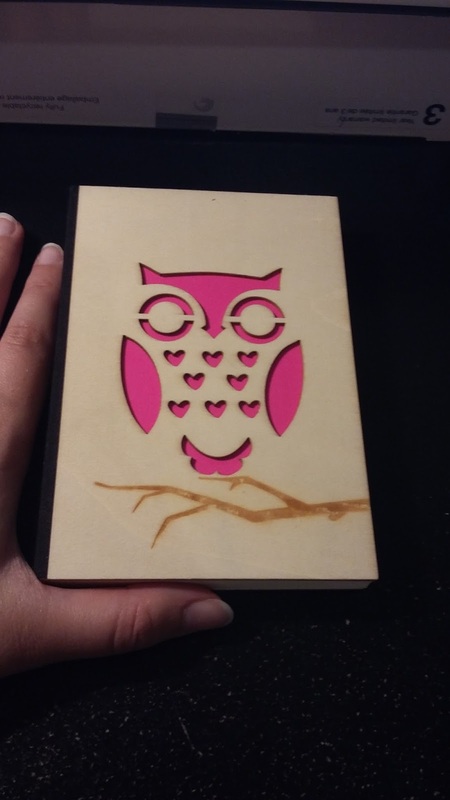 The cover is made of wood, with an owl stenciled into it with hot pink card attached to the other side to make it pop, and the branch has a bumpy texture too. I haven't decided what to use this one for yet. Possibly a little writing reflection journal? You could also turn this into a budget-friendly gift by putting it together yourself. Get something nice and sturdy for the cover and some craft glue to put the pages in, or if you're feeling super crafty, stitch it together! Mix up the paper you include inside, with some lined, some blank, some grid paper—look for different textures and patterns to make it unique. If you're a bit arty, you could design the cover yourself, or you could decorate it with some funky book coverings. A lot of writers use a computer these days, but that doesn't stop us carrying around a notebook. And if we have notebooks, we need pens, and possibly other stationary. So get your writer friend some colourful, good quality ball-point pens or gel pens, depending what you think they might be into. Or get them a gift card for their favourite stationary shop, like Smiggle. Typo also does some funky stationary, with novelty pens galore. Personally, I have more pens than I have room for in my pen-jar ... but they're bloody good pens! 3. Gift vouchers to their favourite book stores. People who write books almost definitely read books (and if they don't, they should!). A gift-card to the local Dymocks or Readings store, or their favourite specialty book store, will never go astray. 4. Subscriptions to literary journals. I love seeing writers support other writers and the publications of their local literary industry. Find out what magazines or journals your writer friend might be interested in—just make sure they don't already have that subscription! Pro tip: Keep an eye out for subscribe-a-thons; I subscribed to 6 Australian literary journals in October, who were all participating in a discounted joint-membership deal. 5. Memberships to a writers group or organisation. Writing groups and organisations give the opportunity to engage with a wider writing community. Whether it be the writers club at your university, or your state's primary writing organisation—if your writer friend isn't already a member, and you think they'd like to be, sign them up. You all know I ran a writers club at my university for a couple of years there. I'm also a member of Writers Victoria, and would never want to stop being a member with them because they run so many excellent events all the time. 6. Tickets to a workshop, reading, or other writerly event. Sometimes, writing groups and organisations run events. Or your local literary festival is just around the corner, and you know your friend would like to go to one of the workshops or attend a certain author's reading. Maybe you could even find something you'll both enjoy and go together! This year I saw Jeanette Winterson read an excerpt from her novel The Gap of Time, following by an entertaining question time at the end. 7. Send them to a writers retreat. If you've got the room to spend big, research writers retreats or residencies that your writerly friend might be interested in. For example, some of the cells at the Old Melbourne Gaol can be hired out as writers' studios, which I think is pretty great and would definitely like to try some time. Maybe the writer in your life would prefer a cabin in a forest, or a little house overlooking the sea. So there are a few gift ideas for any occasion your writerly friend might be celebrating. Or if you are a writer, you could use some of these suggestions to treat yo'self. What are your favourite gift ideas for writers? Some great ideas, Bonnee! The pens I like are rather pricey, considering they're basically disposable, and I feel guilty spending money on them when I can get a box of Bics for practically nothing, but I never turn them down when they're a gift! Enjoy your Christmas!